Justin Holmes first tried out to be a US Open ballperson when he was 14 years old. Admittedly, he was nervous. Scared out of his mind. His emotions got the best of him, affecting his throwing, retrieving and movement. “I thought it was a disaster,” Holmes says. Contrary to his own beliefs, Holmes did well enough to earn a callback. He was more confident this time around and, sure enough, earned a position during the three-week event held at the USTA Billie Jean King National Tennis Center in Flushing, NY. Today, Holmes, 20, is one of the veteran ballpersons at the the tournament, having worked more than 100 matches. He assists Tina Taps, US Open director of ballpersons, and her staff in finding the new crop of talent each year. Much like his initial tryout, the New York City native let his nerves and emotions get the best of him during his early days as a ballperson. He was starstruck when being passed by some of the game’s legends: Serena Williams, Venus Williams, Roger Federer, Rafael Nadal. While Holmes doesn’t get starstruck anymore, that doesn’t mean he isn’t in awe of certain players showcasing their amazing abilities mere feet away. “There are certain times you’re definitely left standing with your mouth open thinking, ‘I can’t believe he or she just did that; that’s amazing,’” he says. Holmes explains that once someone has earned a spot as one of the select 275 ballpersons for a tournament, they are assigned courts based on their skill level. Obviously a first-timer won’t be standing behind Federer at the final on the storied Arthur Ashe Stadium court, but may get the Swiss maestro in earlier rounds. Ballpersons develop a rapport with certain players, knowing their habits and idiosyncrasies like when he/she needs their towel or what certain hand gestures may suggest they are requesting. While certain ballpersons won’t stay with Federer the entire tournament, for example, he will see more friendly faces than not as he advances through each round. 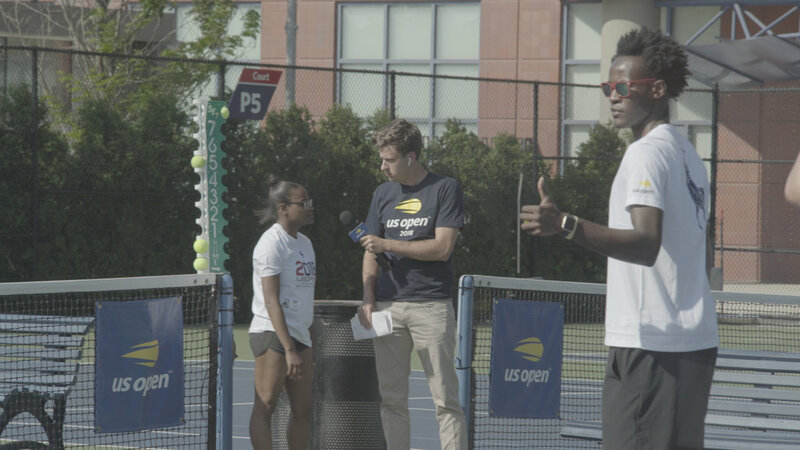 For Holmes, a lifelong New Yorker and avid tennis player and fan, working as a ballperson at the US Open is the closest to being in the tournament without actually playing in it. Driver André Lotterer reflects on his rookie campaign with TECHEETAH in Formula E and his decision to join the all-electric race series.